This is shaping up to be a really significant summer at both Madrid clubs. Real Madrid must decide whether to usher in a new era with a flurry of transfer activity or try to recreate the spirit of Zinedine Zidane’s first spell in the charge by keeping faith with the current squad. The likes of Gareth Bale could be moved on, to make way for new signings. Meanwhile Atletico Madrid may have little choice but to assemble a new-look squad with a host of established key men heading for the exit door. The break-up of a defence that has fired them to league titles and European finals was always coming given the ages of the Atleti back-line. However the club are now facing up to the possibility that other star players could move on this summer after a disappointing season in which they appear to have taken a step backwards when many expected them to kick on. What happens over the summer transfer window will be key in determining whether Atletico Madrid are capable of continuing to compete with the big two in Spain and the best that European football has to offer. There is a sense of inevitability now that Atletico Madrid’s back four will have a very different look to it next season. Diego Godin, Filipe Luis and Juanfran are all veterans of the stunning 2013/14 title win when Atleti came within minutes of also winning the Champions League. They remain first-team regulars to this day but doubts linger of all of their futures and with all of their contracts up this summer. Filipe Luis is widely expected to move on while Diego Godin is understood to have already agreed to join Inter Milan. Atleti are rumoured to have offered Juanfran a new contract but at 34 it’s questionable how much he can still offer this side, certainly at the very highest level. Of the current established first choice back four, only Jose Gimenez looks certain to still be at the club next season. 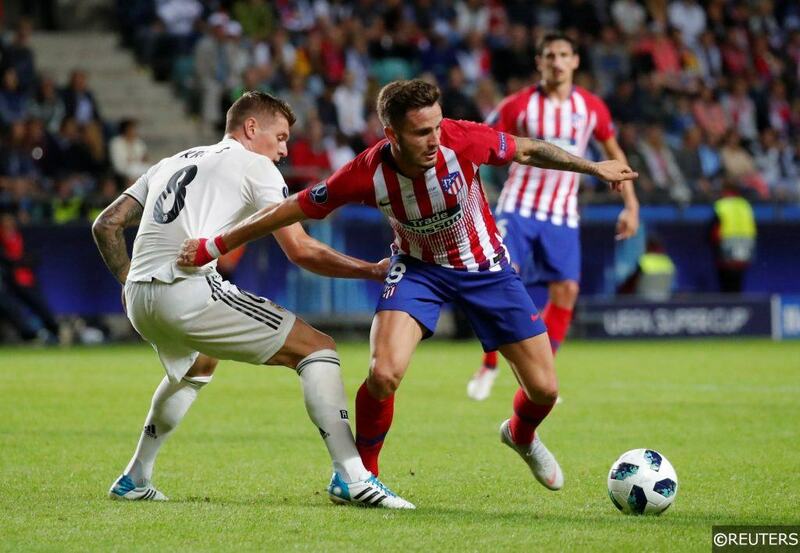 That would be a problem for any club, but Atleti’s plans for moving on are further hampered by Lucas Hernandez’s likely move to Bayern Munich. Capable of playing left-back or in central defence, he would be a certain starter at Atleti next season. However Hernandez came very close to joining the German giants in January and his summer move to Bavaria could be announced in the coming weeks. Atleti will at least receive a sizable fee for the French international, which should aid their bid to assemble a new look defence for next term. Atletico Madrid’s heavy defeat to a Cristiano Ronaldo inspired Juventus has also fuelled rumours that some of their other leading lights may be tempted to seek pastures new this summer. One surprise name linked with a move away over the past week has been Saúl Ñíguez, perhaps the brightest of this new generation of Spanish midfield talent. Atleti would be reluctant sellers but with Manchester City and perhaps Barcelona interested, the 24 year old would certainly command a sizeable fee and they would surely have to think about any bid in excess of £70 million or thereabouts. Saúl is understood to have a relatively strained relationship with Diego Simeone and is one of a number Atleti players who would certainly welcome a switch to a more attacking style. The club’s transfer policy in recent years has changed the dynamic of the squad by adding much creativity and flair. However the style of play hasn’t really changed and it’s not hard to see how a midfielder like Saúl, with a real eye for a goal, could become frustrated in this set-up. On the surface, Saúl would fit very nicely in Pep Guardiola’s Manchester City project and he is currently available at Evens to join the club this summer with Betfair. He is talented on the ball but also a hard worker and is versatile enough to play a number of positions. Somebody of his age and class would be a welcome addition at just about any of Europe’s top clubs and Saúl’s recent exclusion from the Spanish squad may further convince him that he needs to move on to a club that will give him greater freedom to showcase his ball-playing talents. Saúl could feature this weekend for his country and you can view our Spain vs Norway predictions here. Could Antoine Griezmann rethink his ‘decision’? The biggest transfer bombshell could be yet to come though for Atletico Madrid. After a protracted process, Antoine Griezmann finally decided to stay at the club rather than join Barcelona last summer, announcing his commitment in a documentary on Spanish TV called ‘The Decision’. The whole media spectacle was the source of frustration to many Atleti fans, who were beginning to lose patience with Griezmann’s reluctance to commit to the cause. Rumours this week that he is already regretting that decision and is keen on joining Barcelona this summer could bring the whole saga to a head again. Griezmann’s contract is believed to still contain a buyout clause of not much over £100 million although much like last summer, there are some time restraints on that which could see the matter resolved sooner rather than later. That wouldn’t be out of the reach of Europe’s top clubs but the word coming out of Barcelona so far is that they are not interested in going back in for the player with Ousmane Dembele starting to make more of an impression on the left flank and settling down after some problems earlier in the season. Much-like Saul, Griezmann is another player who would welcome a more attacking style of play and he will be more frustrated than most by the club’s inability to kick on following some significant spending last summer. His ability to score 40 goals for club and country in 2018 is testament to his qualities and he remains at the top of the next tier of players beneath the supreme talents Leo Messi and Cristiano Ronaldo. The bookies don’t currently have a market on a summer move for Griezmann but this is certainly one to watch with interest. Any murmurings suggesting that Barcelona would entertain offers for Ousmane Dembele would be an indicator that they may come in. PSG could also be tempted by the Frenchman if they end up having to cash in on either Neymar or Kylian Mbappé with Real Madrid still keen on both players. Even though Atleti managed to tie him down to a new deal last summer, they are still vulnerable to losing the player given there are clubs who could afford to buy out his contract. Therefore it’s a story that could run and run over the next few months and into a summer that could see some very significant transfer activity involving Europe’s elite clubs. Categories: Betting Odds, Blog, Football, and Transfer News. Tags: antoine griezmann, diego godin, Filipe Luis, Lucas Hernandez, and saul. Team Tag: Atletico Madrid and manchester city. League: Spanish La Liga. Sports: Football.